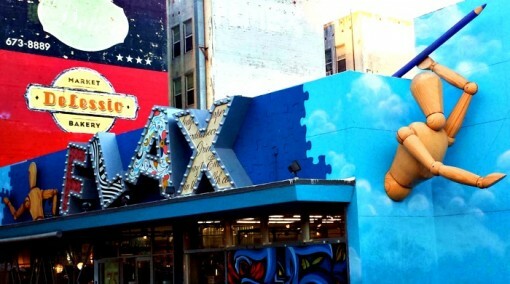 Flax, the funky art supply shop off Valencia and Market is saying goodbye. Flax is being pushed out by a nine-story, 160-unit condo building with parking lot that is set to be developed in that space (Why couldn’t it be the Travelodge instead that’s was getting demolished and replaced?). SFGate: “We were given plenty of notice by the developer. We are looking for a new space in San Francisco comparable to what we have. Given the real estate market, we might have to downsize a little bit,” said owner Howard Flax, who followed his father, Herman, and grandfather, Phillip, at the helm of the store. Just last year, three major projects opened as part of a first wave: 83 Dolores St. (83 units and a Whole Foods); Venn at 1844 Market St. (113 units); and Linea at 1998 Market St. (115 units). Another major development, Forest City’s 88-unit 2175 Market St., is under construction, and Graystar’s 87-unit project at 2198 Market St. just won approvals. Now the neighborhood is bracing for another wave. In addition to the Flax property, the Arthur J. Sullivan funeral home is under contract to the Prado Group, which built 83 Dolores. At the former Home Restaurant at 2200 Market St., Spiers Development Groupis looking to follow its wildly successful Linea with 65 apartments. It’s sad to see Flax go after 37 years at the space. I can’t say that I was a regular, but I really appreciated the character that Flax brought to my area. At the very least, when I go home, I’m really going to miss the colorful facade with its offbeat sign and wooden human mannequin mascot that jutted from the store’s walls.